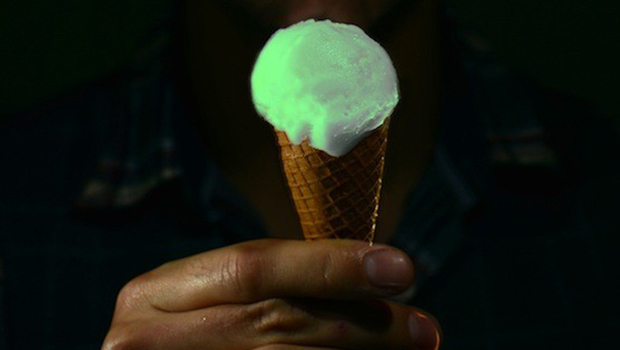 Glow in the dark ice cream: Next food craze? Novelty foods are all the rage. Just look at the cronut craze that hit New York earlier this fall, with fans shelling out upwards of $100 and waiting hours in line for a taste of the new twist on the breakfast staple. Now, a British foodie has unveiled what might become the next cronut: glow-in-the-dark ice cream. To create the glowing treat, inventor and entrepreneur Charlie Francis, founder of the Lick Me I'm Delicious ice cream company, synthesized the protein that gives jellyfish their glow. It's similar to the way that scientists produced glowing bunnies earlier this year. "It's glow in the dark jellyfish ice cream using calcium activated proteins that react when they are agitated, or to put it a non sciencey way, it glows when you lick it," Francis explained on Lick Me's blog. The trick to the glow is the way the protein reacts to the pH of your tongue, which is neutral. Your tongue warms up the protein in the ice cream, raising its pH level and producing the glow, he explained. "Is it safe to eat? Well I tried some and I don't seem to be glowing anywhere, so we'll go with a yes for now," he added. With the ice cream checked off their bucket list, they're already on to the next glowing product. "We've also made a non-jellyfish version using quinine from tonic to make a glow in the UV dark gin and tonic sorbet which is pretty neat," he wrote. If you're jonesing for a lick of this novelty treat, prepare to pay top dollar: a single scoop currently goes for 140 British pounds, or about $225.